I have been using a Resmed Auto SV for about a year. Last night I had to switch to my backup machine, Respironics System One Bi-pap autoSV. What noticed right off the bat is the difference between inhaling on Resmed vs the Respironics. On the Resprionics there is a "delay" when inhale. I inhale and it seems like I am "sucking" and a few msec later the pressure increases and then I can take a complete breath. Is this normal with the Respironics algorithm? Or is my machine not working right? Thanks for any and all input. Hang in there for answers to your question and good luck to you as you continue CPAP therapy. It's a bit hard to answer your question without more information. Are you using the exact same pressure setting? Your profile reads 6-15. The minimum pressure may work with a ResMed machine, but you may want to raise it when using a respironics machine, as they are slower to respond. Thank you! I will raise the pressure on the Respironics and see how tonight goes. G'day jallain. Welcome to Apnea Board. of inspiration and at the beginning of expiration. most comfortable setting for the patient. Rise time cannot be adjusted when Bi-Flex is enabled. From the description of the problem you gave above, it sounds like Bi-flex should be off and rise time set to zero. Maybe one of the Respironics experts can confirm (or contradict) this. Thanks for the input. I went into the setup menu because I wanted to change the rise time. My machine does not have a rise time parameter. I will turn on bi-flex and see if that helps. Thanks. transitions from exhale to inhale seem not to be a priority for the PR BiPAP. flex settings center on the transition from inhale to exhale. What you describe sounds to me like Bi-Flex is the cause. The default setting is 2. Try turning it down or off. The transition to IPAP occurs when you start to inhale whereas with ResMed it occurs when you stop exhaling if I remember correctly. Try the bi-flex at 1 OR if adjusting the Rise Time the Bi-flex has to be off. Probably why you couldn't adjust it. • Flex type - This screen displays the comfort mode setting. You can select None or Bi-Flex. • Bi-Flex - You can modify the Flex setting (1, 2 or 3) on this screen if you enabled Bi-Flex. 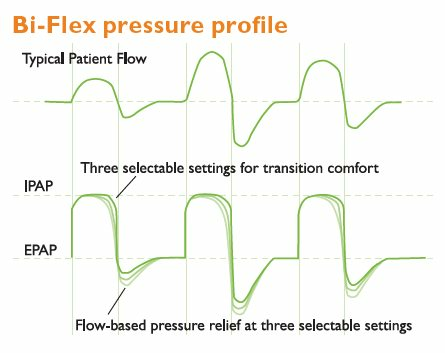 The Bi-Flex comfort feature allows you to adjust the level of air pressure relief that the patient feels when exhaling during therapy. The setting of "1" provides a small amount of pressure relief, with higher numbers providing additional relief. • Rise time - Rise time is the time it takes for the device to change from the expiratory pressure setting to the inspiratory pressure setting. This screen allows you to adjust the rise time so you can find the desired setting. A setting of "0" is the fastest rise time, while "3" is the slowest. This is only available if Flex type is set to None and PS max is greater than zero. Yes, you are exactly correct. I used the Phillips ASV machine for my sleep test, that was required by my doctor, before I could be approved by Medicare for any ASV machine. Since my machine at that time was the ResMed AirCurve 10 VAuto, and I was used to it, I quickly noticed the ever so slight delay in the Phillips machine in responding to the inhale breath. I found it so troublesome that I had trouble sleeping for any length of time during the sleep test. Whereas the AirCurve was seamless in responding to the inhale breath, the Phillips had that ever so slight delay in it's response time. It is not anything big, and over time I guess one would get used to it.